There are risks aplenty in Australia, centred on expensive houses, high leverage and low saving. Some investors are more bearish: they see Australia as the next ‘Big Short’. That’s a tail risk, but remember both that there are some macro offsets to housing weakness, and that markets this year have already moved to price in some downside risk. 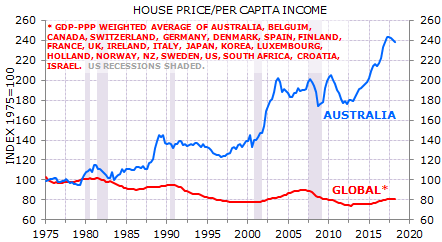 The bear case on Australia is easy to make: house prices are at nosebleed levels relative to history and relative to global peers (Exhibit 1); households are highly leveraged; the household saving rate is low and national net saving rate is negative; and there is much less room to cut interest rates now than in prior cycles. While all these things have been true for some time, the new news is that house prices are now falling. Importantly, this is the first house price decline in Australia not associated with RBA policy tightening or rising unemployment. The housing market spontaneously started to combust. 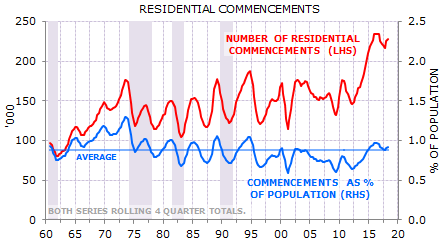 Second, while Australia is building a lot of houses, the pace is normal relative to population (Exhibit 3). 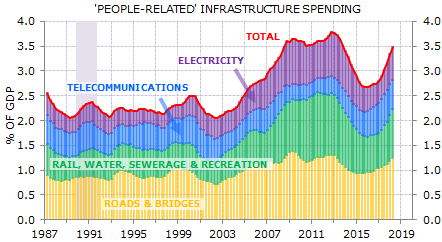 Third, population growth costs, and one of the costs is rising infrastructure spending (Exhibit 6). This is a particularly job-intensive sector. Let me be clear why I’ve listed these positives. It is not because I think they will be powerful enough to accelerate Australian growth. It is because they will provide a partial offset to the adverse effects of falling house prices on consumer spending. 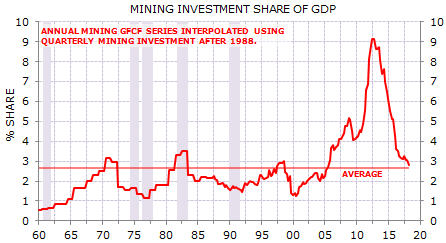 If these offsets did not exist then it would be right to expect a recession in Australia as an investment base case. 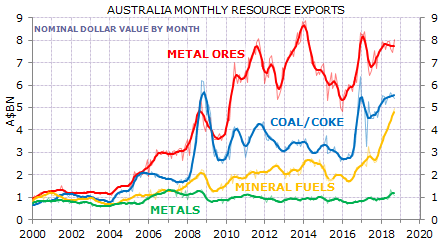 Markets are aware of the risks: the A$ has fallen US9¢ from its 2018 peak; rate markets started this year expecting the RBA to hike, now nothing is expected for 2019; Australian equities have under-performed global equities; and in absolute terms Australian banks fell 25% from their 2017 highs. All of these trades made sense given the prospect of softer domestic growth and weakness in housing. None of them required recession to work and there may be a little more juice in all of them. But here’s the change: to expect that these trades – short A$, long rates, short banks – to work through 2019 will increasingly depend on recession becoming the base case. It is not my base case. I will be watching credit approvals for housing and leading indicators of employment to judge whether the recession risks are rising. Interesting stuff. Recession is not my base case for 2019, either. As said many times, I expect the economy to slow materially and trend towards 2%. But it takes a near catastrophe to put an economy with 1.6% population growth into recession (which is not a good thing). 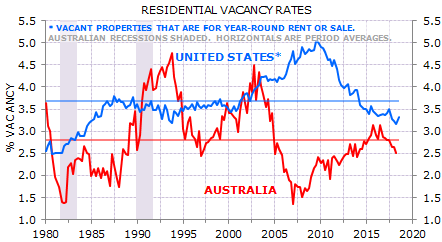 But I also think that the RBA will cut to stabilise house prices for while. 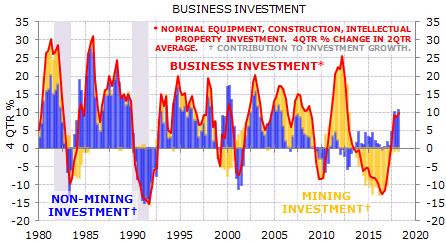 Despite headline positive growth it will not be a fun economy. For me the recession case is more “end of cycle”. That is, as Aussie housing markets stumble lower slowly, an exogenous shock becomes a disaster scenario as bank funding costs rise into an RBA cash rate at effective zero. That’s the recession case; a kind of double dip scenario for housing markets. Even if we don’t see a intense shock, it is my view that that will play out in slow motion anyway as China slows into the early 2020s choked by debt. 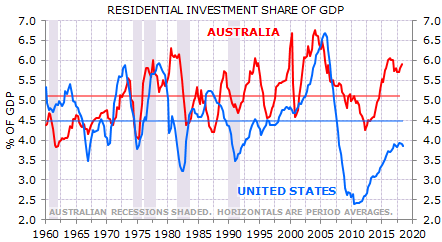 That said, the more sudden recessionista case is obvious in Gerard’s residential investment as proportion of GDP chart. It’s been much higher for much longer than the US. This is clearly the population growth angle yet it is untested through a major property correction. Bulls will argue that immigration will return any housing market surplus to deficit quickly. But equally possible, if the correction disturbs the macro and the labour market cracks, is that the number of people per household begins to rise with belt tightening. That would hand Australia an huge property surplus overnight and really get the dwelling construction bust going, dragging the local economy into recession.